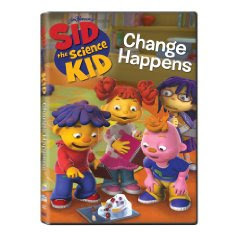 The newest bunch of DVD's from the Sid family include "Change Happens" and "The Bug Club." While I had no problem getting my 3 boys (ages 6, 4, and 2) involved in the bug one -- they love anything with wings, legs, or scales -- I was also happy to see how well they took to the "Change Happens" video! In addition to learning basic science principles from their friend Sid, they got a chance to sing, dance, and laugh. What better way to absorb some scientific principles? (Note: Only specially-marked packages contain the following bonus.) Perhaps the coolest thing about these DVDs, however, is the BONUS Front Row Fun disc they come with. Yes, you heard me --- BONUS! I love free stuff, so seeing that the specially-marked DVDs each included a sampling of some of my kids other favorite shows (including Dive Olly Dive, Hopla, Hermie and Friends, and Word World), really made my day. The full-length episodes are valued at $14.99 on their own! 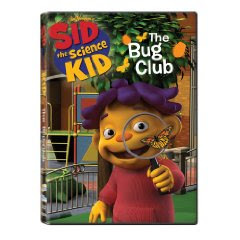 If you love Sid, you'll really enjoy watching these videos with your kids :) Distributed by NCircle Entertainment, they are available in stores and at Amazon.com for around $10 - $15.